More light, more visibility, more safety. OSRAM celebrates 10 years of the NIGHT BREAKER family! For the past ten years, OSRAM has been writing success stories with the product family NIGHT BREAKER all over the world and this has intensified in the last few years. 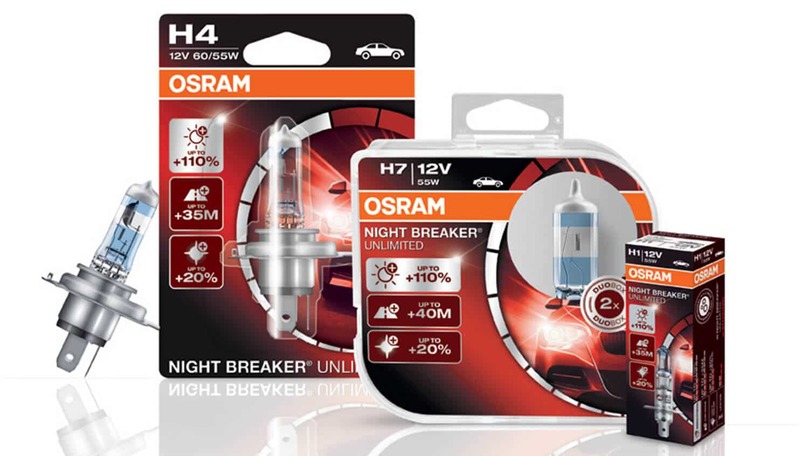 NIGHT BREAKER was first launched in September 2007, and today NIGHT BREAKER LASER is the top product in the halogen performance range from OSRAM; providing up to 130 percent more light compared to standard OSRAM halogen bulbs enabling drivers to see further and keeping them safer on the roads. “The great and continuous success of the NIGHT BREAKER family has highlighted the many opportunities for our partners and their customers to maximise their sales and profit potential” said John Lancaster, Speciality Products (SP) Business Unit Manager for the UK. Use NIGHT BREAKER to break through the night and increase your sales and profit potential! Since the market launch in 2007, the NIGHT BREAKER product family has continually developed and expanded. Currently, the halogen portfolio consists of the product families NIGHT BREAKER LASER, providing up to 130 percent more light and NIGHT BREAKER UNLIMITED, which completes the portfolio providing up to 110 percent more light compared to standard OSRAM halogen bulbs. Both ranges are available for almost all current ECE bulb types. For vehicles with Xenon (HID) headlights, OSRAM offers the XENARC NIGHT BREAKER UNLIMTED range, which provides up to 70 percent more light compared to standard OSRAM Xenon bulbs. Headlights fitted with XENARC NIGHT BREAKER UNLIMITED (depending on the type of headlamp) produce a light beam that is up to 260 meters long, which is equivalent to the length of 2.5 average football pitches. The advantages of increased light output are obvious and depending on the type of headlight, the NIGHT BREAKER LASER product produces a beam that is up to 40 meters longer compared to standard OSRAM halogen bulbs, enabling obstacles and pedestrians to be recognized sooner. With the above-average brightness and whiter light, drivers will also feel fatigue-free when driving for long periods of time at night. A combination of a highly engineered filament and pure xenon gas filling help the LASER bulbs achieve the extra light output. They have a unique design with a laser etched precision window providing maximum performance and the leading brand name ‘NIGHT BREAKER’ has also been etched on to the glass of the bulb giving them a very distinctive appearance. Offer your customers a choice! If drivers are made aware of the upgrade bulbs that are available to them they are very likely to upgrade. It’s very important to offer a choice of products as not only will the driver benefits from the additional benefits of more light and a whiter light, you too can profit from the opportunities sales of upgrade bulbs can bring. The darker nights are approaching – get set for the bulb rush! Contact your nearest Parts Alliance branch for a free copy of the OSRAM bulb menu.